Well a lot has happened since my last post. I have read several books but have not had time to post reviews for those books. So let me just take a few seconds to post a review for my last read. I promise to try to post reviews as I finish books but sometimes I am being pulled in so many different directions at once. I am sure you know how it is. Now onto the review. 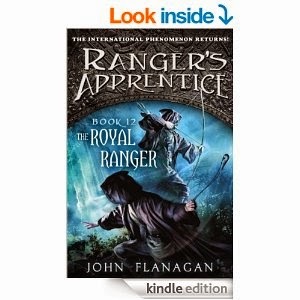 The last book that I finished reading was "The Royal Ranger" (Ranger's Apprentice) written by: John Flanagan. I have loved this series ever since my son asked me to read the first book in the series. I was so bummed out when he wrote the final to the series, then he came out with this one. This one is set some 15 plus years after The Lost Stories. Will is now the gruff Ranger. He has changed and is no longer the happy go lucky Will that he used to be. It is heartbreaking once you learn what changed Will. This book starts out with a punch and doesn't let up. Horace and Cassandra now have a teenager who is testing them. They are worried about how to make their daughter behave before something happens to her and they are worried about Will. Old friends get together they look to Halt for guidance and once again he does not let them down. I really hope he does follow up books and maybe an entirely new series with Will and his Apprentice. Great book pick it up and don't let the fact that it is a young adult book stop you from enjoying this series. 10. The Emperor Nihon-Ja 11. The Lost Stories and finally 12. The Royal Ranger. John Flanagan also has another series out I have read the first book of the new series and of course I love it as well. I am sure at some point I will come back and do a review after I read the book again to refresh my memory. The other series is The Brotherband series. If you follow this blog you will find out that I read a lot of books and I have eclectic taste. I will pretty much read anything. Now if I like everything I read or not is another story. The other thing you will see, I will not bash any authors on this blog. My goal is to give my opinion on different books not to bash authors. I will however tell you if I am friends with any of the authors on Facebook or not. Oh, I am not friends on Facebook with John Flanagan. Now I have to run I have dream catcher's to make and if I have time a chicken coop to finish. Have a wonderful day! !